With only weeks to Nigeria's 2019 elections, campaigning is at fever pitch. It has not been without drama. 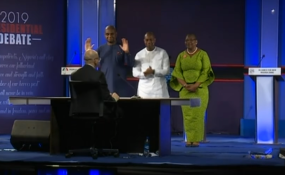 On 19 January 2019 the first presidential debate took place in Abuja. There are currently 73 people eyeing the country's top seat, according to the Independent National Electoral Commission . But only five were invited for the debate – which didn't go down too well with some of those left out . "The structure of our economy is such that services constitute 60% of it." An economy's size is measured by its gross domestic product, Ndubuisi Nwokoma , professor of economics at the University of Lagos , told Africa Check. "GDP is the monetary value of finite goods and services in an economy. It is a reflection of the volume of activities going on in it," he said. Nwokoma directed Africa Check to the National Bureau of Statistics for the most recent figures on Nigeria's GDP. "About 60% of Nigeria's workforce is engaged in agriculture." "The rural areas of this country have about 53% of our population." Moghalu's concern was that communication technologies such as the internet and cellphone networks were concentrated in urban areas. This, he said, kept more than half of Nigeria's population in the dark. But a nationally representative sample of more than 37,000 households found that the share of those in rural areas is higher. "44% of children in Nigeria are stunted because they are malnourished." A child is defined as moderately or severely stunted if their height for their age is more than two standard deviations below the median of the reference population. Standard deviation measures of how dispersed data is from a reference point or "middle". The Multiple Indicator Cluster Survey found that in 2016/17 , 43.6% of Nigerian children were moderately or severely stunted. Another 22.8% were severely stunted. "1, 400 kilometres is the length of our borders today." Durotoye was laying out his plans for cross-border security. Building a wall across all 1,400 kilometres of the country's border was not feasible, he said. But Nigeria's total border is much longer than this. According to Nigeria's border community development agency , the longest border is with Cameroon to the east, at 1,690 km. Nigeria's border with Niger is 1,497 km . Its border with Benin is 773 km and with Chad 87 km. Nigeria's total land border measures 4,047 km. "We have 175 policemen to 100,000 citizens in Nigeria. UN recommendation is 300 police to 100,000 citizens; some will argue 400 police to 100,000 citizens." Only conflicting official numbers of police officers in Nigeria are available, including those from members of the Police Service Commission . Despite our continued efforts, we have been unable to get hold of publicly available data on the number of officers in the Nigeria Police Force . We will continue to request this data from the police commission. "Members of the farmers' club make up one-third of our workforce and 60% are women." While Nigeria's statistics agency has employment figures for 2018, the most recent that shows employment by sector is from the third quarter of 2017. This Dr Isiaka Olanrewaju, the director of household statistics at the National Bureau of Statistics , told Africa Check. "Today, we have 108 million people that are homeless." Many media reports have attributed the 108 million figure to Nigeria's Bureau of Public Service Reforms . But the agency has no official data on homeless people in Nigeria, Olusegun Oguntuyi, who works at the bureau told Africa Check. The figure could be as high as 108 million "if it is where one has a secure tenure, life and property", Nubi said. "But if we define home as a shelter from rain, a roof over one's head, then it may not be as high as that." "Our budget for health is 3% of the total budget. We will raise it to 15% which was agreed in Abuja." The federal government's 2018 budget was N9.12 trillion. Some 3.7% of this, or N340.456 billion , was allocated to the health sector. Nigeria's proposed 2019 budget sets aside N315.62 trillion for health, or about 3.6% of the total N8.83 trillion budget. — NB: We are checking the final two claims from Nigeria's presidential debate. They are on security and land use. Check back for the verdicts.